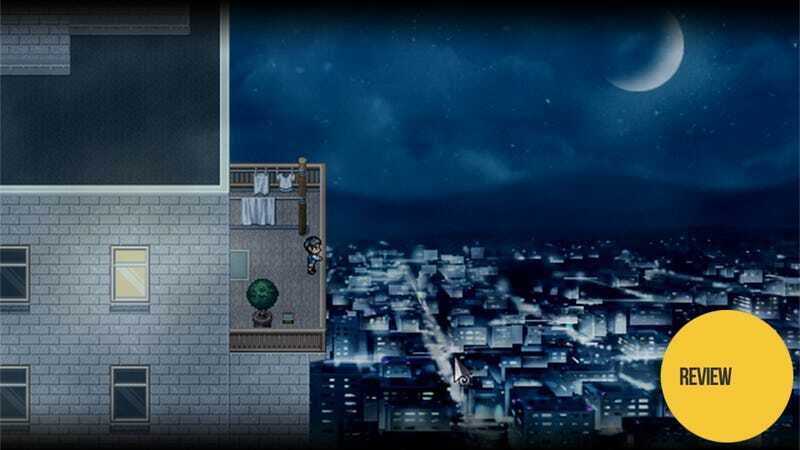 I fell in love with To the Moon back in late 2012 after I picked it up in a Steam sale. It is easily one of the most emotional gaming experiences I have ever had. So needless to say, I expected great things from its short sequel A Bird Story. What I didn’t expect was a total lack of words. From the moment you select “begin” at the title screen to the time the credits begin to scroll at the end, there is not a word of text in the game. Rather, the story is told simply through actions. You take control of a nameless child and begin walking him through his daily life. You go to school, spend some time alone on the playground, come home, eat dinner, watch TV, and fall asleep studying. And from one simple day in his normal life, you learn volumes about the character. You see he is isolated at school—occasionally picked on, but far more often simply ignored by all. He has no friends at all and returning home does nothing to change his isolation as there is no one awaiting him—there is only a note stuck to the fridge. Yet even then you see he is loved, as he awakens to find that while asleep at his desk, he has been wrapped in a blanket. Moreover, like any other kid, he longs to have fun. If you choose to enter his mother’s room, he’ll spend a few moments jumping on the bed. The game makes it clear without any words that you are seeing the life of a lonely child, devoid of friends and family support. And all this is in the game’s first dozen minutes. When it comes to the gameplay, instead of receiving any sort of text tutorials, you are instead shown a picture of the buttons on your keyboard with an accompanying animation showing what such a button press would do. As for where to go, you are guided by everything from arrows to ghost images of yourself—though you are often able to wander aimlessly as well. And while I did go off the beaten path whenever possible, I never found myself confused as to where to go or what to do. This is actually a bit surprising as, much like To the Moon, A Bird Story is surreal in the way of dreams and memories. This is because you are not seeing the actual events as they happen. Rather you are seeing events through the memories of a child with a wonderfully active imagination. Given the fragmented nature of memory, you see time jump from one event to another but still in such a way as to create a cohesive narrative. Thus, you may be walking through the school only to have the hallway slowly turn into the neighboring park. Moreover, the paths between locations will often change. Sometimes they will simply connect to a different location. Other times the screen will rearrange itself in real time, with the trees themselves moving to herd you into a new area. But while the game is excellent in the way in which it is told, the actual plot is far from the most original of stories. After all, it really is just the story of a lonely child finding an injured animal and befriending it while nursing it back to health. It follows the formula exactly and offers nothing in the way of surprises. The other possible point of contention is the game’s length. A Bird Story is short, really short. It took me 82 minutes to beat and I was exploring every area to its utmost. However, while short, the game feels exactly as long as it needs to be. Never does the story drag nor does the gameplay become monotonous. It is a sweet, brief experience that doesn’t overstay its welcome. All in all, A Bird Story is like a breathtaking sunset: short, beautiful, and leaving you wanting more. While likely a story you have seen before in some form or fashion, the creativity in telling it not only without words but also within the limitations of 16-bit graphics easily makes up for that. If you are a fan of To the Moon or other plot-heavy games that play on your emotions, A Bird Story is most certainly worth your time.